This was the weekend of the heatwave! yay! I quietly declared myself on holiday. No gym, no mowing! time to assemble the cushions and covers outside. Too hot to do any thing else. The heat made me quite knocked out, I love the sun, but I do love a shady spot too! 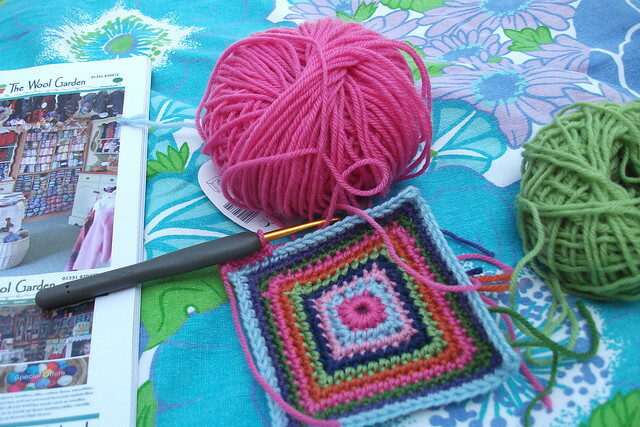 Being called by the hot pinks, I started a new cushion. You may wonder whats happened to 'retro man', well he came together quite quickly and is being blocked ready for sewing. 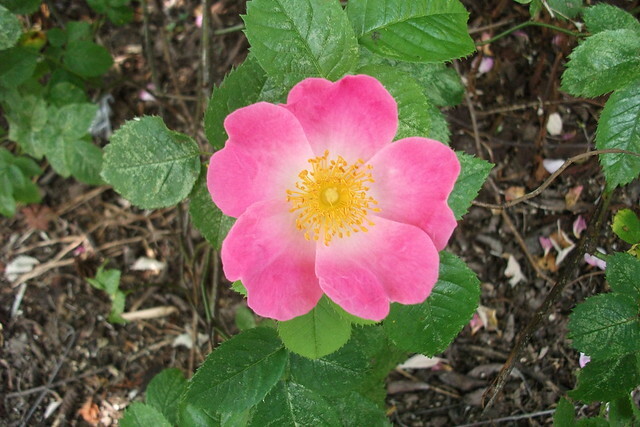 Now I feel the need for pink and pretty. really it was me, Mollie and the dog! and the flowers, and the birds and the bees. loving the aqua colour too! Lemon curd! I brought this one because this is the one my Mum used to buy. (This isn't a sponsored post!). After reading several of Gillian's lovely posts about lemon curd I realized I missed having a little taste of lemon curd and never having brought my own I decided to start now. Gillian is very talented and makes her own! It was such a lovely lemony treat with some french bread, while sitting in the garden. So thank you Gillian for reminding me to treat myself. It brings lovely memories and even my son remembered it too. Little dog just tried some lemon curd! I think it was a bit sharp! Sunday was just as hot if not hotter. The day was a bit more frought, with some driving around and a battery and charger situation, which I knew nothing about but had to resolve anyway. It's all about keeping the peace here. And trying to avoid being hit by plastic bbgun pellets! I also watched in awe with the rest of the tennis world as Andy Murray battled it out on center court at Wimbledon, in what had to be the hottest day ever. In my opinion they were both winners! Phew. In his interview, he was so blown away he couldn't remember how he won his last point! I'm not a follower of tennis but I enjoyed that last set, in what must have been a global tennis moment. 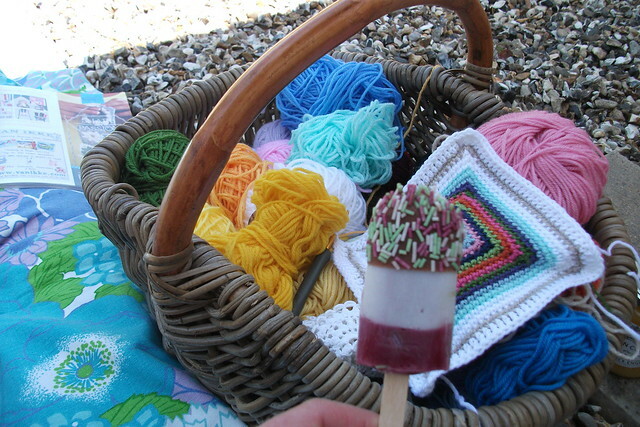 How lovely and neat your crochet is - love the choice of pink and green. I LOVED the tennis and know nothing the game. Lovely new cushion! Very cute dog! 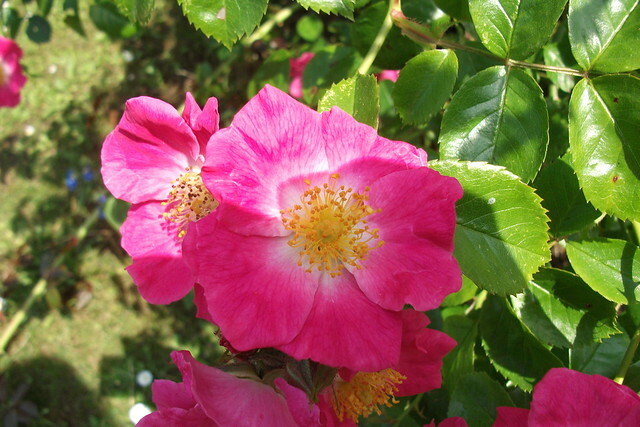 Thanks for sharing the summery pics. Beautiful rose, crochet and colours! Cute 'little dog' and lovely wide-eyed cow! 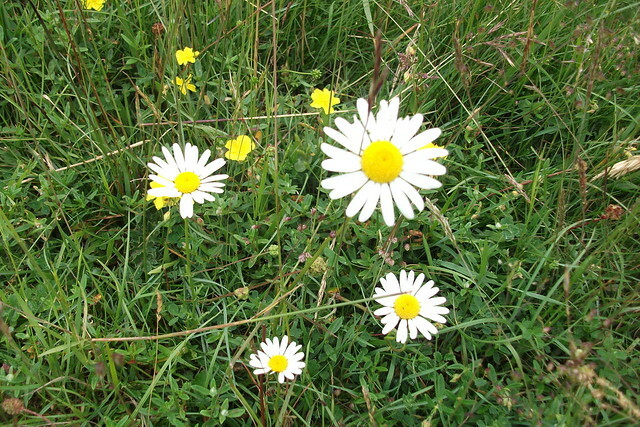 Sweet daisies and beckoning bench. 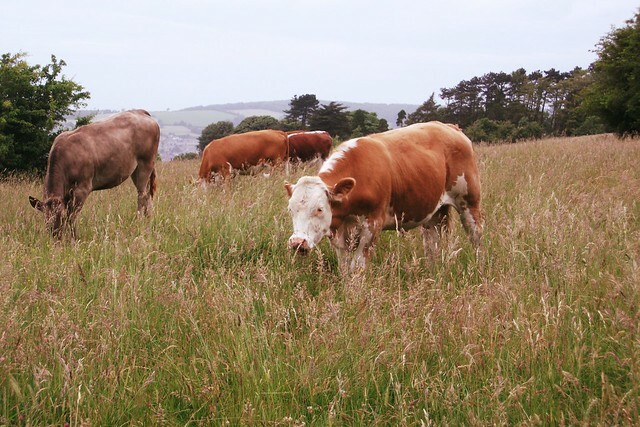 I thoroughly enjoyed your post again Heather, thank you! Lovely hot pink square. I am waiting to see your retro-man cushion, but even more i want to see the pink and aqua one..only SC or DCs(which ever you use :-)) Must be quite the effort!! But it is looking amazing! Ah, lemon curd, I love it too! One of the big disappointments at Woolfest this year was that either I missed it or the stall selling home made lemon curd wasn't there. I've always brought some home in the past, even though I do make my own too. Pretty crochet Heather :) Hope you can find enough shade in the week ahead, this heat is too much for me! I will be round for a lemon curd sandwich with my crochet soon. Will that be OK? 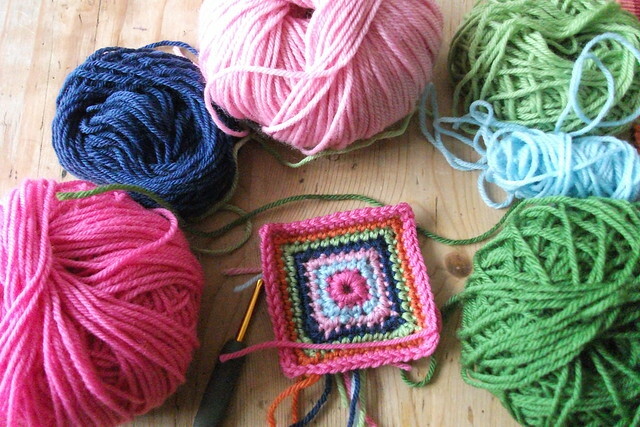 oh I love that crochet square - fabulous colours! Gorgeous nature inspired wool colours Heather - love the pattern too! A normal summer day in Texas is 37 degrees... I totally get wanting to be in the shade as well! 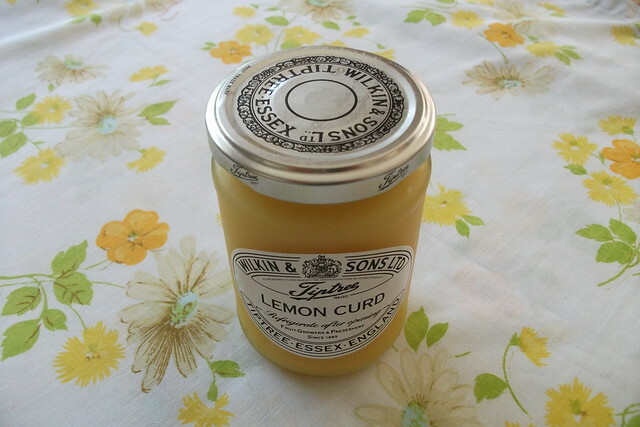 I've never had lemon curd! But I love lemons, am I missing out? 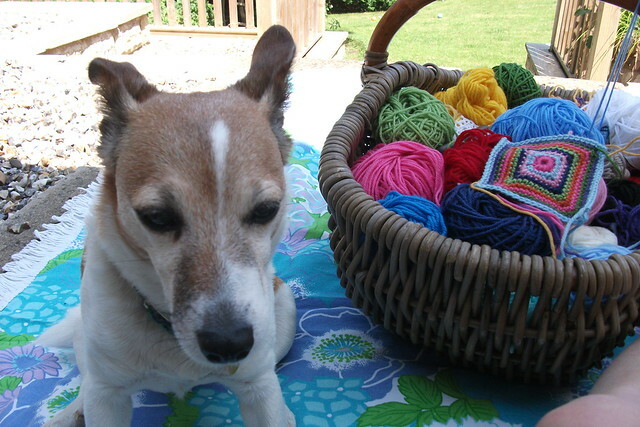 Your crochet is gorgeous! 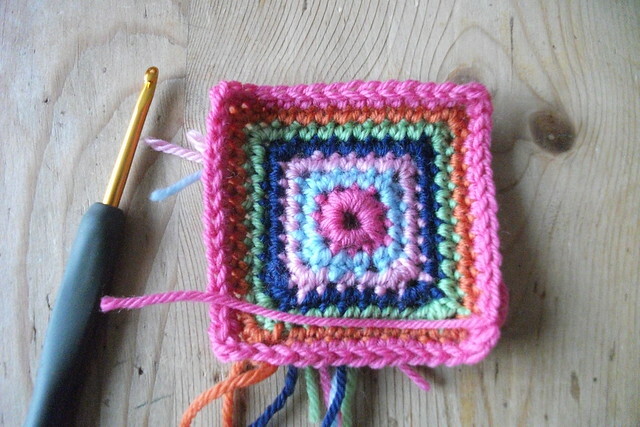 Believe it or not my Hannah wants to learn to crochet, she's 8, I'll show her your gorgeous squares! They are beautiful! 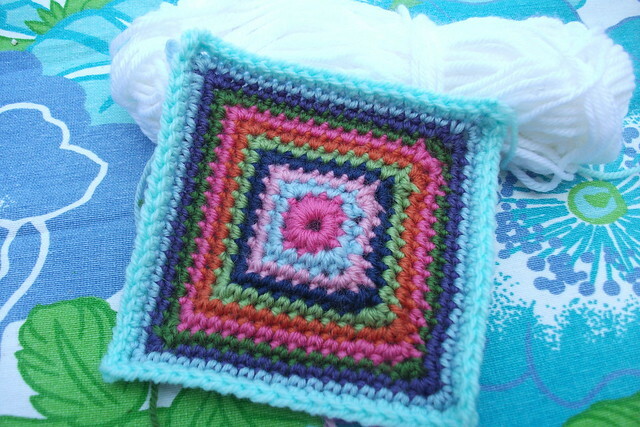 Hi Heather,Love your little crochet square!! !Such nice color combo's!! !I would so like to go on a walk with you!! !It looks so peaceful and clear and so very VERY green!! !Keep cool and stay happy with your Happy Hot Pinks!!! it's Adrafil, a range called Regina. It's a 100% merino washable wool. The aqua is probably a thrifted find! I get some of my brighter wool mix colours like this. 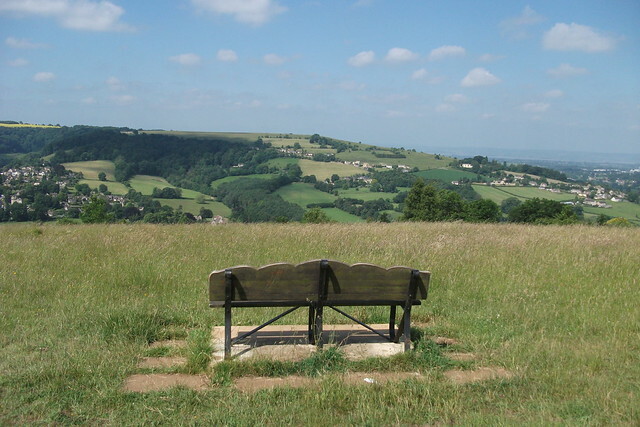 That bench looks like the perfect place to sit and..... well, just sit!!! !